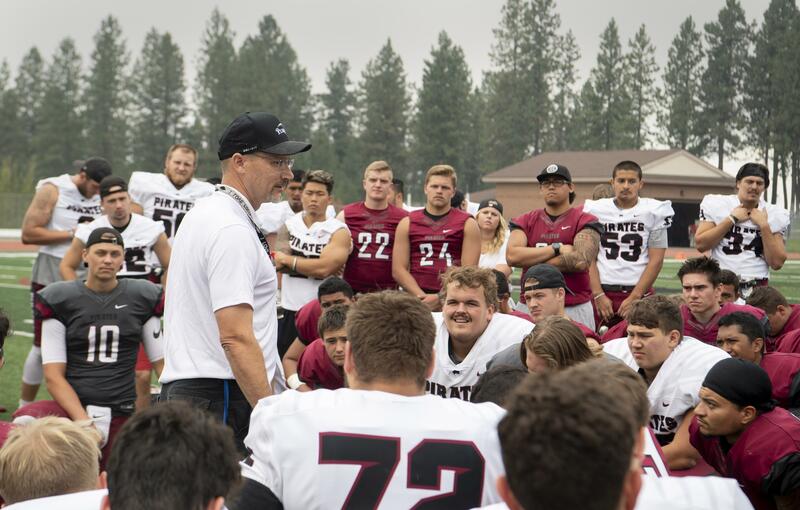 Whitworth opens its season Saturday at home in the Whitworth Pine Bowl against the La Verne Leopards, a familiar nonconference opponent. This will be the 13th meeting between the Pirates and the Leopards and sixth straight year the teams have played. Whitworth leads the series 11-1 and has won the last four meetings after dropping a game to the Leopards in 2013. The Leopards, from the Southern California Intercollegiate Athletics Conference, are coming off a 3-5 season. They scored 25.8 points per game, while allowing 31.6 last year. Leopards coach Chris Kirch is in his eighth year and boasts a 26-37 record. They last won their conference in 2015. The Pirates will hope for a repeat of last year’s Leopard taming when they coasted to a 53-0 victory in the third game of the season. But with seven offensive and four defensive starters gone from that performance, including quarterback Ian Kolste, the Pirates will need their new faces to mesh in a hurry if they want to see a similar score. Junior Leif Ericksen takes the starting reins from Kolste who graduated with almost every Whitworth passing record to his name. Kolste joined the Whitworth coaching staff this season and will continue to help mentor his former backup. Whitworths’s experienced defensive line will be tested by James Gonsalves, a junior running back from Martinez, California, who only started two games last season. While that doesn’t sound too intimidating, he cemented his starting status this season with two impressive performances to end last year when he ran for 390 yards and six touchdowns. To bring those stats back down to earth, 258 of those yards and five touchdowns came against Whittier College, the team that was last out of 242 teams in all of Division III football in terms of total defense. The other team he shredded was Pomona-Pitzer, ranked 173rd in total defense. At halftime, Whitworth’s second-year Fieldturf facility will be dedicated and renamed the Puryear Field in the Whitworth Pine Bowl in honor of Ron and Georgia Lee Puryear. Whitworth alumnus Jim Puryear (’91) and his wife Bobbie were the primary donors for the new field and wanted to dedicate the facility to his parents. The game kicks off at 1 p.m. and can be heard on 1230-AM beginning at 12:45 p.m. Published: Aug. 31, 2018, 4:55 p.m. Updated: Aug. 31, 2018, 5:42 p.m.